As the design-savvy masses descended on the modernist mecca of Palm Springs for the 10th annual and ever-growing Modernism Week, our craftsman were hard at work delivering a showpiece for a very special client. Several months prior, renowned and prolific artist, Shag, stopped by our studio to inquire about getting a custom sofa built for his newly renovated condo in the heart of Palm Springs. We were both excited and humbled that one of our long-time design heroes not only found our company but was compelled enough to visit our warehouse to ask us to collaborate and build his plans for a new centerpiece sectional sofa for the living room of his new condo. Naturally, we said, "Of course!" Shag’s artwork is ubiquitous and his signature style is unmistakable. Over the span of his career he has created a huge body of work. So much so, that this year he set out to design, build, and open his own retail store on Palm Canyon Drive in the heart of the Design District, just north of downtown. He planned to take the wraps off the store and have his grand opening during Modernism Week. In honor of this new achievement, he was planning to host parties and many guests at his new condo during the week. 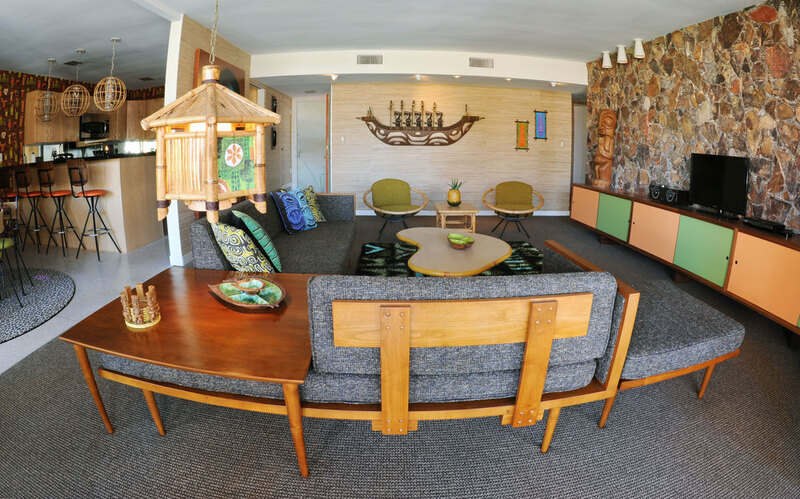 The only thing he was missing to cap off his remodel was stylish, mid-century seating for the main room. So, after searching online for existing options, he found us and decided to have us build a large custom sectional based loosely on our existing designs. After receiving his design and collaborating on the details, we delivered his custom designed sectional in time for his Modernism Week events. Shag made a guest appearance in this shot. It was an absolute pleasure to work with Shag on this one-of-a-kind, multi-functional conversation piece and we wish him all the best on his new store. We’re raising our Mai Tais to new adventures, Cheers!